22 August, 2010 | Media Release The ACTU today said that Australian people have sent a clear message during this election that their rights at work matter, and they will not support parties that are committed to policies which undermine workers’ pay, conditions and rights. “Our two million union members, and the more than 10 million workers in Australia have succeeded in forcing all major parties in this election to commit to fair work laws. 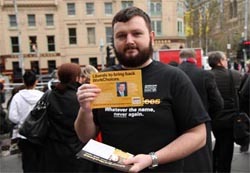 “We know that WorkChoices was a significant issue in workplaces and in the community and weighed heavily on the public’s mind in the lead up to this election. “Whatever party forms Government, the ACTU will continue to advocate for better rights at work on behalf of working Australians and hold the Government to account for its workplace policies. “Unions remain extremely concerned that to date we have not seen a detailed IR policy from the Coalition. “There remain major workplace rights, including protection from unfair dismissal, individual contracts and award rates of pay and conditions that are not fully protected by legislation, and which could be eroded by a Coalition Government. “We are also concerned about the future of superannuation and tax policy, investment in Australian industries and jobs, and the delivery of health and education to working families.